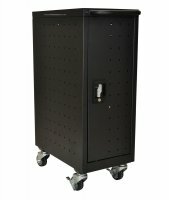 Versatile sit down laptop/overhead or standard computer workstation with four shelves. 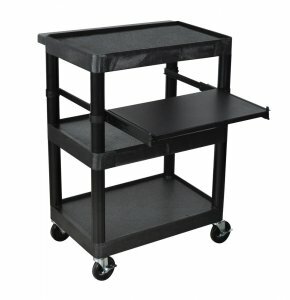 Unit includes an adjustable keyboard shelf, surge suppressing electrical outlet and 4" casters, two with locking brakes. Integral safety push handle is molded into top shelf. Cable Track cord management system keeps cords neatly secured and free of entanglements. Lifetime warranty. 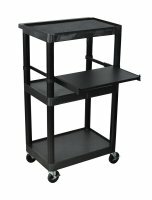 Molded shelves and legs will never stain, scratch, dent or rust. Retaining lip and sure grip safety pads prevent equipment from sliding.